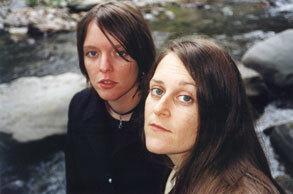 Tara Jane O’Neil & Cynthia Nelson became acquainted in 1993, when their bands (Rodan & Ruby Falls, respectively) were beginning to tour & play in each other’s cities. They became friends & secret lovers in 1994 on Valentine’s Day in Louisville. Recording in New York & D.C. followed, and the “Salt Lick” EP was complete. 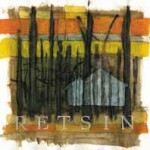 Retsin’s second record was made in 1995 in a basement in Louisville and was dubbed “Egg Fusion”. In 1995 Tara Jane also recorded with her new project, The Sonora Pine, and Cynthia worked on the first full-length Ruby Falls release. “The Retsin Good Times Band” first went on the road in 1996, with Greta Ritcher on drums & Todd Cook on bass, and they all had the touring time of their lives to date. In 1997 they toured again with drummer Tony Bailey. The foursome went bare bones, sleeping overnight in highway rest stops & drinking free coffee provided by the Daughters of the American Revolution. Tara Jane & Cynthia had also set out on an acoustic tour, playing their pickupless music & perfecting the craft of quietude with good friends, Ida. This deepened the “Tara Jane & Cynthia – Ida” connection which led up to the “The Ida Retsin Family” album. “Sweet Luck of Amaryllis” was recorded in Louisville during the hard winter of 1997. The acoustic songs on “Sweet Luck of Amaryllis”, juxtaposed with full-band anthems, reflect the recent years of musical courage & maturity. 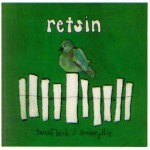 The lyrical expression of Retsin’s blissful four year existence has brought all kinds of estranged lovers back together. “Cabin in the Woods” was recorded in a cabin in the woods in upstate New York during the wonderful summer/fall of 2000. The acoustic songs captured therein reflect the bounty of nature and rural living that surrounded them during the recording process. Cynthia Nelson writes songs and plays many instruments. She writes poems and plays drums in the Naysayer. Tara Jane O’Neil writes songs and plays many instruments. She records music, makes drawings and paintings, and will be releasing her second solo record later in 2001. Tara and Cynthia have abandoned any formal notions of home and have become ramblers, having just left the cabin in the woods to winter in Louisville and to tour. They will soon be playing for your nickels.